Hawaii Gold Jewelry.Com is full service online jewelry website offering Hawaiian Heirloom jewelry. Our mission is to provide quality Hawaiian jewelry products and services and practice integrity in all that we do. 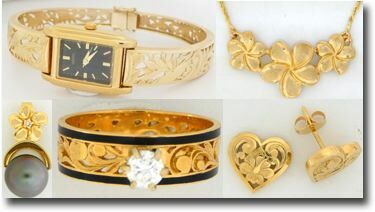 Over 900+ high quality Hawaiian 14K Solid Gold Jewelry items (made in Hawaii) are featured on our website. Quality - The quality and craftsmanship of this 14K solid gold jewelry is very high and we stand behind it with a 30 Day Money Back Guarantee and a Lifetime Warranty. Prices - Our prices are very competitive. We purchase directly from the manufacturer with no middleman. We are not going to be the cheapest because of our high quality, but we keep our marketing cost very low, allowing us to offer great prices. Official/Real - All our jewelry is stamped with the manufacturer's federal registered trademark and are stamped with metal fineness mark of 14K. Nothing fake here at all. Free Shipping - FREE SHIPPING for continental US, Hawaii and Alaska! We use U.S.P.S. insured mail or insured registered mail for all our shipments. There is a flat fee for international shipping. Local / Hawaii Based - Owned and operated by software engineer/developer Ernest Abrams (MaBusiness Consulting). A well known/established Hawaii based company in Honolulu, Hawaii for over 20 years! Call us anytime 808-739-9797. Secure Website Tranactions - HawaiiGoldJewelry.com entire online ecommerce system driven by Safe and Secure PayPal and populated by the MBC DirectoryMaker. Click here to see why Safe & Secure PayPal™ is the best way to shop online;. PayPal makes people feel comfortable when shopping online.